If you remember Skellomanjo Dlareg, this is his son, Marrow Dlareg. 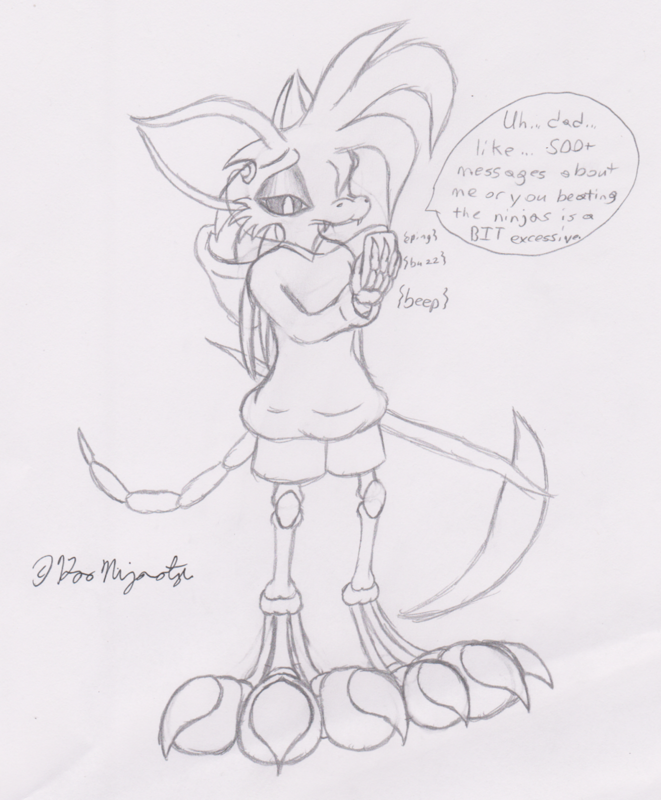 Marrow is pretty much the opposite of his father, where Skello is very aggressive and always tense about being better than Kao, Marrow really doesn't give two bones in his body about being better and prefers to just chill to his music and sleep. He's not far off from a typical goth teenager who's often dragged along to help his overly amibitious father, but he does find excitement when he challenges Wolfen to a fight and actually loses, finding out (to his father's concern) that he really likes the "adrenaline" rush he gets when he feels "pain" (as he normally can't feel pain, being a skeleton. Personality: That typical teenager who always seems extremely bored and doesn't seem interested in doing anything sums up Marrow very well. On the outside, he looks like he has little motivation to do much but chill in a coffin listening to music, but deep down, he does have a great drive to do really exciting stuff. He rarely shows that excitement cause of his father constantly bugging him about beating Kao though, but finds his thrills occasionally. Power: Marrow often uses his scythe and dark magic to cripple and poison his opponents, just like Skello. Unlike Skello, Marrow has better defense due to his ability to ignore pain almost entirely, but his lazy nature keeps his attack power rather low. What makes him difficult to take down is how he likes to poison his opponent, then slowly wait until they die while healing himself or just playing defensively. Yes, Marrow is a Starmaninjian skeleton (specifically a Skelloranan). There aren't many Starmaninjian skeletons cause it kind of goes against the nature of being a Starmaninjian, but they are pretty exotic and I do love skeletons actually (inspired a bit by Dry bones). His head is actually somewhat organic though, allowing him to make expressions and move his mouth naturally instead of like a detached jaw (though it still looks bony), but below his shoulders is just like any other skeleton. I'm still trying to figure out some things when it comes to Starmaninjian bones, but they DO have bones in thier ears. That's how they're able to pivot yet keep their shape. They also do have bones in the core of their forehead hair, though not as thick as Marrow's, it reinforces the forehead hair a little. That's backs up that all Stars have that hair. For the most part, thier bones are actually meant to be about as complex as human bones (like all the ear bones and bones locking about), but due to drawing limitations, I really can't be bothered to actually model or draw each of their bones. They probably have less than 206 though.